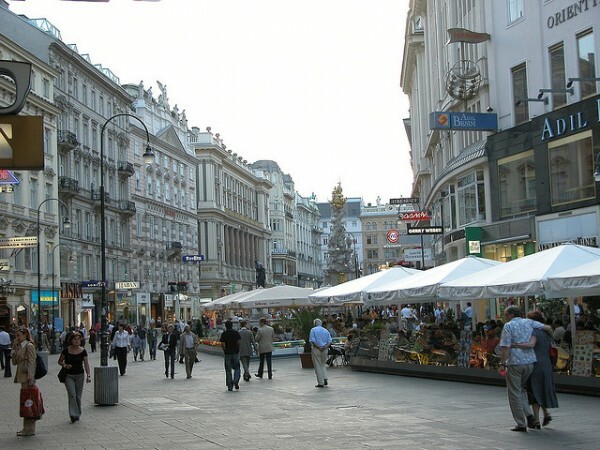 The Kärntner Strasse in Vienna is the most elegant shopping street of the city that lies from the Stephanplatz to Staatsoper on the Ringstrasse and ends at the Karlsplatz. At the time of the Roman Age is was a main road, connecting the center of the city with the city wall. Unfortunately a major part of the street was destroyed, only a few old buildings remained from the past times. 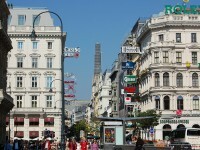 The street was redesigned in the second part of the 20th century and became a pedestrian street. It was a pedestrian area similar to the Walfischgasse with cafes, shops, traditional and fashion boutiques and with busy shopping areas since 1974. 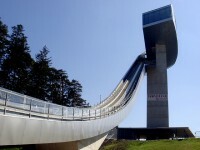 The name of the street it is given after the southern state of Kärnten (Carinthia) and it can be seen from the Stephan dome to the southward direction. 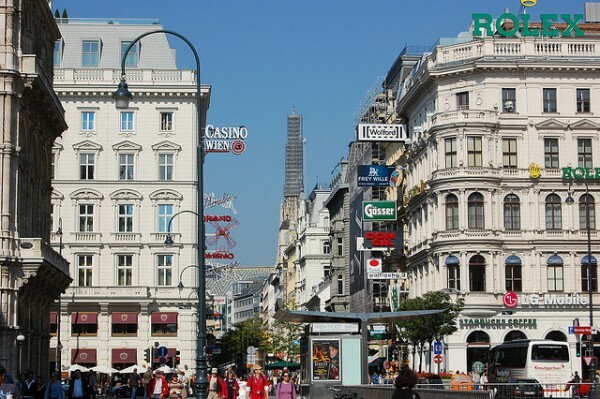 Under the intersection of the Kärtner Strasse and the Ringstrasse lies the Opern passage, which is the first underground pedestrian area of ​​Vienna opened in 1955 with shops and snack bars. 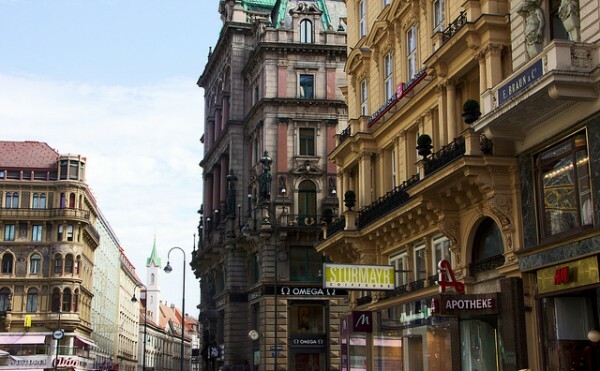 Unlike nearby streets, the Kärtner Straße in Vienna, known since 1257 as the “Strata Carinthianorum” and enlarged in the 70, has very few historic buildings, as we already mentioned. Most of the old buildings dates from the 18th century, including those at numbers 4, 6 and 17 with interesting facades. Only the Maltese Church still retains some features dating from 1265. Inside this are many shields of the Knights of Malta, and a stucco monument from the year 1806 with Turkish figures on both sides in the memory of Jean de la Valette, Grand Master who defended Malta from the Turks in 1565. The oldest building of the Kärtner Strasse is the Esterházy Palace (No. 41) from the year 1698 which hosts the Adlmüller extravagant fashion house, where the Viennese high society buys its clothes. Nearby are clothing stores with the works of famous designers such as Jil Sander, Christian Dior, Pierre Cardin, Emanuel Ungaro, Burberrys, Daks and Fiorucci with corresponding prices. 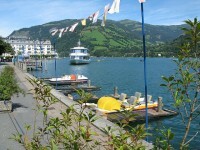 The traditional folk costumes, the evening dresses, the latest fashion and sportswears are also very well represented. At no. 26 is located the “J. & L. Lobmeyr” porcelaine and glass store that has a glass museum on the upper floor which is open duRingstrasse peak hours. The Vienna Tourist Office has its headquarter at no. 38. A relaxing break from shopping can be spent in the elegant surroundings of the café of the legendary Sacher Hotel on the corner of Philharmonikerstrasse, where you can taste a slice of the famous Sachertorte.